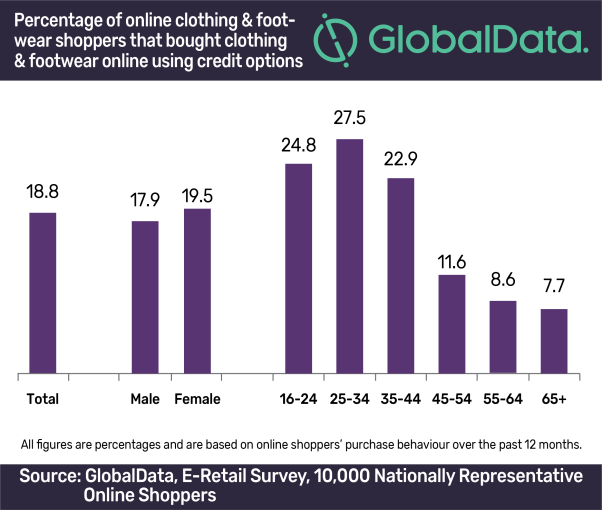 An increase in the number of retailers offering ‘try before you buy’ payment methods is driving up the use of credit options amongst young consumers buying online, with 26.3% of online clothing & footwear shoppers aged 16-34 using credit options such as ‘try before you buy’ in the past 12 months, according to GlobalData, a leading data and analytics company. Fast fashion retailers targeting young consumers in particular, are driving impulse purchases with the use of ‘buy now, pay later’ payment options, with ASOS stating that the introduction of its Klarna payment method helped to drive UK retail sales to increase by 23.4% in FY2017/18. Despite credit options seeming to be hassle-free, convenient and a win-win for both shoppers and retailers, ultimately, they will encourage young consumers to get into debt – UK consumers already have an average credit card balance of £1,144, according to GlobalData’s consumer payments insight survey.